You know that quantitative aptitude section is most important in bank exams in PO and Clerk and for other competitive exams because if you want good score in bank exam then you have to score good in math's. In competitive exams the most important thing is time management, if you know how to manage your time then you can do well in Bank Exams as well as in other competitive exams. That’s where maths shortcut tricks and formula are comes into action. So continuously we are providing shortcut tricks on different maths topics. Today’s topic is time and wages problems for bank exam. This is the one of the most important topic in quantitative aptitude section in bank and SSC exam. 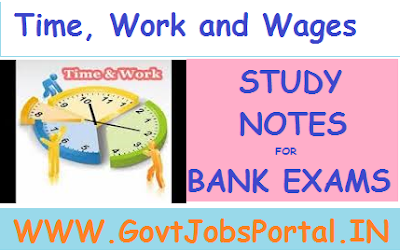 You should know how to solve time and wages questions in very short time for bank exam. From this chapter around 1-2 questions are given in the SBI and IBPS exams. For this here we are providing shortcut tricks and quicker method to solve time, work and wages problems in very short time. This topic is similar to the time and work problems topic but the only difference is that in this topic we will also find out wages of the workers according to their time for that particular work. Time and wages formulas: If ‘M1’ persons can do ‘W1’ work in ‘D1’ days and ‘M2’ persons can do ‘W2’ work in ‘D2’ days then we have a very special general formula in the relationship of M1 D1 W2 = M2 D2 W1. THEOREM: Wages are distributed in proportion to the work done and in indirect (or inverse) proportion to the time taken by the individual. This theorem helps in shortcut tricks, which we will use for time and work or wages questions. Ex. 1: A can do a work in 6 days and B can do the same work in 5 days. The contract for the work is Rs 220. How much shall B get if both of them work together? Ex. 2: A man can do a work in 10 days. With the help of a boy he can do the same work in 6 days. If they get Rs 50 for that work, what is the share of that boy? The boy can do the work in 10*6 / 10-6 = 15 days. Ex. 3: A, B and C can do a work in 6, 8 and 12 days respectively. Doing that work together they get an amount of Rs. 1350. What is the share of B in that amount? Ex. 4: two men undertake to do a piece of work for Rs 200. One alone could do it in 6 days. With the assistance of a boy they finish it in 3 days. How should the money be divided?